The Joint Admissions and Matriculation Board (JAMB) arrested two biological children of an accredited Computer Based Test (CBT) centre owner in Lagos, over alleged examination malpractice. Reports state that the arrest was made during a monitoring tour of various CBT centres in Lagos State on Tuesday by the board’s Registrar, Prof. Is’haq Oloyede. The arrested children were said to have been caught using their mobile phones to take pictures of questions of the ongoing Unified Tertiary Matriculation Examination (UTME), with the aim of compiling them and forwarding them to some tutorial centres which, in turn, would use the questions to defraud prospective candidates. Regarding the arrest, the Registrar said, “Unfortunately they are not aware that we are ahead of them. We have put in place, cutting edge technologies that expose fraudulent practices intended to undermine the integrity of our examination. 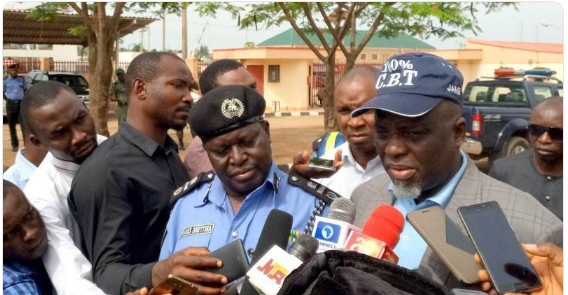 “What they did here was to deliberately disconnect the CCTV, thinking that we would not be able to track whatever happened here through our central CCTV in Abuja”. The Registrar disclosed that the centre would seize to continue with the board’s examination with immediate effect, based on this crime. He said that all candidates previously scheduled to sit for the examination in the centre would immediately be moved to another one.